The ATH M50 has long been a studio favourite. Is this new x-series version a worthwhile improvement? 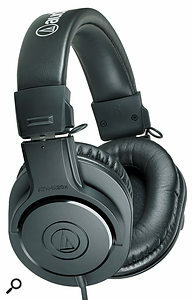 Audio-Technica's ATH M50 headphones have been a popular studio workhorse since their introduction. Lightweight and comfortable enough for prolonged use, offering useful levels of isolation from external sound, and competitively priced, they tick all the important boxes. They sound respectable, too, with a gentle 'scooped' tonality that, to my ears, tends to emphasise the bass and the upper mid/high-frequency region. A recent update to the A-T range of headphones sees the addition of a lower-case 'x' to all four of their models. The new ATH M50xs are thus joined by three progressively more affordable variants called the ATH M40x, M30x and, you guessed it, M20x. A-T sent all four models for review, and I was also able to compare them directly to my own nearly new pair of original M50s. From a visual point of view, the M50xs look almost indistinguishable from the M50s, but happily, Audio-Technica have addressed one of the few weaknesses of the original design: its fixed cable has been replaced by a removable one, attached by a mini-jack connector which rotates a quarter-turn to lock it into place. A-T also say that they've 'refined' their earpad design, and it does indeed feel slightly different. If anything, I found the M50xs a little more comfortable than their predecessors, though the difference is not night and day. Changes in sound are likewise very subtle, to the point where it is hard to pinpoint how much the difference is attributable to the new earpad design and the way it positions the phones on the head. For what it's worth, my impression was that the newer design has a slightly more open and bright top end, and at the other extreme of the spectrum, seems to emphasise a fractionally deeper range of bass frequencies than the original M50s. However, if you needed to replace an existing pair of M50s that had died for some reason, the M50xs would still feel instantly familiar. The treble lift is restrained enough to keep the sound from becoming fatiguing, and doesn't have too much of the 'splashiness' that often plagues bright headphones — they sound much better in this respect than, say, the Sennheiser HD25-IIs. The low bass, meanwhile, is more prominent than on many studio phones, yet still pretty articulate. They offer a level of isolation that's perfectly acceptable for most purposes, though for location work and other situations where isolation is crucially important, I'd still choose the HD25-IIs. All in all, although they are of course not quite as revealing or accurate as a good pair of open-back headphones, the M50xs have all the qualities you'd look for in a pair of general-purpose studio cans. Overall, then, I think Audio-Technica have done exactly the right thing with their x-series revamp. They haven't fixed anything that wasn't broken, but they have taken on board user feedback regarding the cables, and have made small yet worthwhile improvements where they could. The range as a whole represents excellent value for money, and in particular, I think the M20xs and M40xs are hard to beat at their respective prices. The market for mid-priced studio headphones is fiercely competitive, and at around the same price as the M50xs, you could also consider the Shure SRH840, Beyer DT250 and DT770, Sennheiser HD25-II and AKG K271 MkII, among others. All the major manufacturers likewise make models that compete directly against the cheaper models in the M-series. Audio-Technica sent the complete range of x-series headphones for review, and I was surprised at how good the ATH M20x sounded considering the very modest price. Lightweight and comfortable, with a no-frills black plastic construction and a fixed, straight cable, they are somewhat less sensitive than the M50xs, and in comparison, exhibit a rather restrained top end, which actually sounded more natural to me on some material. There's plenty of bass, albeit rather less well-defined than on the M50xs, and there are some noticeable resonances in the mid-range, but I've heard plenty of more expensive phones that sound less good. Move on up to the M30xs, and you get something that is much closer to the flagship model, both in appearance and sound. Again, though, you get a fixed cable, and unlike those of the M50x, the earcups rotate only in one plane ('up and down' rather than 'fore and aft', as it were). The M30xs' tonality is broadly similar to that of the M50xs, but more aggressive and, I felt, more tiring to listen to. If I'm honest, I preferred the M20xs, especially for extended listening. The M40xs are closer still to the M50xs, with an equally detachable cable, and earcups that can be rotated to suit even the most bizarrely shaped head. (For some reason I actually found them slightly more comfortable than the M50xs.) Sound-wise, they share many of the M50xs' good qualities, but the top end is noticeably less smooth, with some edginess creeping through on sibilants, acoustic guitars, hi-hats and so forth. That said, they are close enough that I can imagine many people settling for the M40xs rather than fork out an extra £50$60 for the top-of-the-range model. 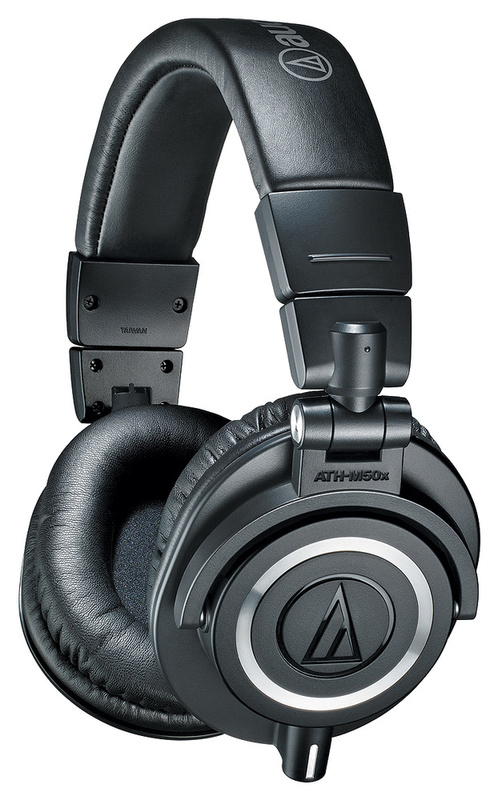 The ATH M20x offers remarkably good value for money. Worthwhile improvements over the original M-series phones, especially the detachable cable on the M40x and M50x. The range as a whole offers excellent value for money, particularly the M20x and M40x. As long as the Audio-Technica 'family sound' suits your needs, none. Audio-Technica's range gives you a lot of headphone for not very much money. What's not to like? ATH M50x £159, M40x £99, M30x £69, M20x £49. Prices include VAT. ATH M50x $169, M40x $99, M30x $69, M20x $49.